Minister of Emergencies and Affairs of Population Protection from Consequences of Chornobyl Catastrophe of Ukraine Nestor Shufrych awarded special structure of Dnipropetrovsk garrison of Emergency Minister of Ukraine for courage and personal fortitude while elimination of consequences of emergency situation, which happened at Mandrykivska Street, 127 of the Oblast center. According to Information and Explanatory Work and Mass Media Communication Department of the Emergency Ministry of Ukraine, 63 rescuers received departmental awards and badges. 9 officers earlier received regular special ranks. N. Shufrych expressed hope that high official bodies of the country will worthily mention the heroic deed of the rescuers. 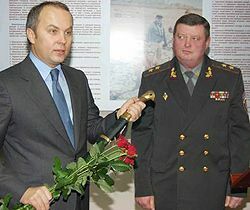 In his turn, leader of Main Department of the Emergency Ministry of Ukraine in the Dnipropetrovsk Oblast Victor Butkivskiy in the name of Department presented to the Minister the rarity sabre.